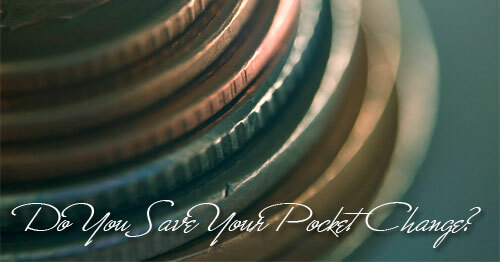 Do You Save Your Pocket Change? For One Indiana Man It Adds Up To A New Car Every 10-15 Years. Whenever I take out cash and pay for things at the store inevitably I end up with a pocket full of change at the end of the day. Quite often I'll just spend the change in the vending machine at work, or leave it in my car for times when i need 25 cents here or a nickel there. More often, however, I'll take the change home with me and put it in the change bowl on my dresser, and every few months I'll take it in and have it deposited in my bank account. Usually it adds up to a hundred dollars or more, which goes directly into my savings. The question, however, is this. What if you were always paying in cash, and every time you got change it went directly into your change jar? How much money would it add up to, and how much could you save in change alone? For most of us who don't religiously save our change the coins in our jars adds up to enough to buy a nice dinner or a couple of video games. But for one Indiana man who was a self-proclaimed penny pincher, the coins added up to be enough to buy a new truck! Paul Brant considers himself a penny pincher, but his savings in quarters and dollar coins really paid off. Brant, 70, used more than $25,000 in change to help buy a new Dodge Ram half-ton pickup truck Friday — 13 years after buying another truck with spare change. Brant has been storing his change for years, and estimated he had about $26,000 in coins for Friday's purchase. In 1994, he bought a Dodge pickup and a Dodge Neon using about $36,000 in quarters.“As long as you don't put your hands back in the till, it really adds up,” he said. Brant stored his change in coffee cans, water jugs and piggy banks over the years, and was escorted by sheriff's deputies as he brought the rolled coins to the dealership. He's not the only person to be doing things like this, there have been others over the years, all over the world. A businessman in China did something similar in 2010 to buy a van. Mr Zhao, a businessman, dropped bundles of notes, none worth more than one yuan – about $0.15 – at the dealership in Jining, in northern Shandong province. Extra staff had to be brought in to work shifts to count it all, a clerk at the dealership said. Finding a dealership to accept the notes, many of them stained and torn, was not easy, he said. “I held onto the money waiting to see if they would accept it so that I could buy the car. The manager of this dealership decided to accept my cash, so that was really helpful to me,” he said. What If That Money Had Been Invested Instead? It's fun to think about how small amounts of change saved up over the years can add up to large totals. It's truly inspirational. But what if the money wasn't just saved in jars, but instead was invested? How much could it have been? Let's take the first story for example. If you invested $26,000 over 13 years (how long it took him to save it up) with an average rate of return of 8% you would have almost $42,469 after 13 years. That's a difference of $16,469 by investing your money instead of just allowing it to sit in jars! That's enough to buy another nice used car! Now realize that he has done this twice now, the first time he saved up $36,000. If he saved at the same rate it probably took him around 18 years the first time – so if he had invested that money at 8% returns he would have garnered almost $71,245 instead of $36,000. That's the power of compound interest! So next time Mr. Brant, I recommend investing your change by depositing it every few months in a nice index fund! Have you saved your pocket change and used it to buy something? Tell us your story in the comments. Good for him but this is irresponsible. He should have a good rewards card (Amex or otherwise) and put every single purchase on this card. The points add up incredibly quickly. If he were paying cash anyway, he would just pay the card off every month without penalty. This would lead to far more in value than paying cash and keeping the money that was already his to begin with. I use a rewards debit card now with Perkstreet and get back like $600/year. Can’t beat that! I used to throw my change into ajar every night. At the end of the month, I had $35-40. I saved and invested that change over the years and it helped pay for investments and rental properties. I no longer spend cash, so I do not have change. I actually spend less and save even more! I have to agree with you there, I don’t have nearly as much change as I used to as I use a debit card for most purchases nowadays. We save up our pocket change, but deposit the money whenever we get to $100. It would also be interesting to see how much money the man lost due to inflation. Over 15-20 years, it must be a large sum of money. Very cool story! I didn’t know people were saving up to buy whole cars with spare change. I keep all of my spare change that I generate in a jar and usually cash it in and deposit to my savings account once it gets full. Previous Post: Should You Itemize Your Tax Deductions? Next Post: Would You Use A Local Currency Instead Of A Federal Reserve Note?